On An Overgrown Path: Will Sinfini Music still be with us in 2022? Will Sinfini Music still be with us in 2022? I was delighted to find such a passionate advocate of my and other contemporary music forging his own path (not so overgrown!) clearly in opposition to most current trends. I've always felt that it is and will be strong enthusiasm that will change the world! Thank you so much... all best and bon courage. When On An Overgrown Path sounds its last post and is finally killed off by Twitter, I hope that two phrases will be carved on its headstone: 'strong enthusiasm' and 'opposition to most current trends'. But the end is not yet nye and, insha'Allah, I will share my strong musical enthusiasms for a few more years. 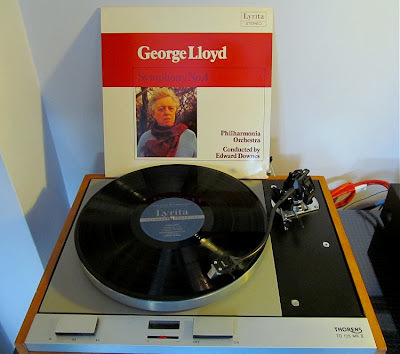 But others have done it so much better, and a very good example of the power of strong enthusiasm are the Lyrita recordings from the 1980s by the much-missed Edward Downes' of George Lloyd's unfashionably tonal music - that is my LP of his Fourth Symphony in the photo above. As I have said here before, George Lloyd's Requiem, which is being performed at the late night BBC Prom on Sept 3rd, is a real discovery. But, as I have also written, to claim he is a neglected genius would be wrong. George Lloyd may not have been a genius, but he is a very good and unjustly overlooked composer. Which means he needs strong enthusiasm to bring his music to the audience it deserves and not the timid enthusiasm that consigned his Requiem to the midnight Proms ghetto while programming his much less memorable HMS Trinidad March in the last night alongside Richard Rogers' 'You'll never walk alone'. Strong enthusiasm would have kicked all the jingoistic excesses out of the last night on Sept 7th and replaced them lock stock and barrel with his Requiem on the pretext that its dedication to Diana Princess of Wales makes it suitably patriotic. That would deliver a double whammy: a real discovery would reach a lot more ears and the last night of the Proms would be rid of the curse of the corporate hospitality junket. On An Overgrown Path's first tentative post was in 2004 and four years later the BBC Radio 3 appointed its 'official bloggers' - whatever happened to them? Will Sinfini Music still be with us in 2022? Who cares? Instead, please raise your virtual glasses to nine more years of strong enthusiasm and opposing current trends On An Overgrown Path. Also on Facebook and Twitter. No freebies involved and the header photo of my audio system which definitely opposes current trends is (c) On An Overgrown Path 2013.